I am totally getting this deal! 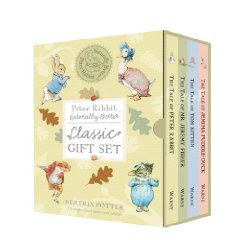 The Peter Rabbit Naturally Better Classic Gift Set which is 4 hardcover books, is only $6.48 and if you have the trial of free prime shipping....then this is really a great deal! Go HERE and snag it while you can! Peter Rabbit . . . Naturally Better is back again, and this time he’s brought some friends! This brand-new eco-friendly boxed set includes four classic Beatrix Potter tales that meet “naturally better” criteria and showcase their “green” appeal with the eyecatching vine cover design. Titles include: The Tale of Peter Rabbit, The Tale of Mr. Jeremy Fisher, The Tale of Tom Kitten, and The Tale of Jemima Puddle- Duck. Perfect for holidays, baby showers, birthdays, collectors and more! Out of the list of "perfect" things this set would be good for...can anyone guess what I will be doing with it? LOL.